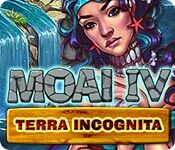 Moai IV: Terra Incognita is rated 4.1 out of 5 by 7. Rated 5 out of 5 by onesweettammers from Fun and addicting! Great game! Can't wait for the next one! 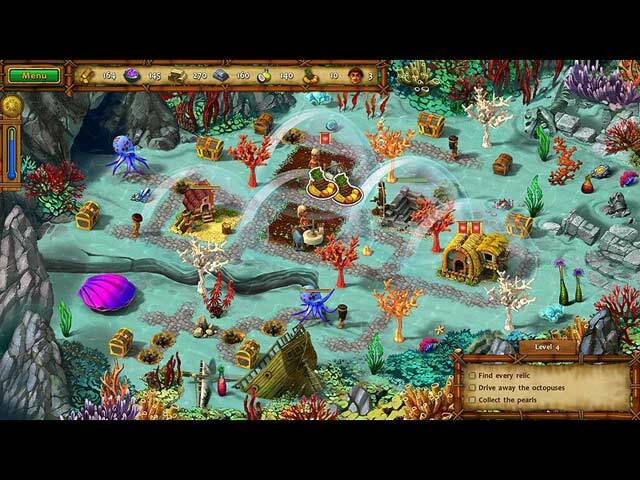 Rated 5 out of 5 by Strgzy2 from Great installment Enjoyable TM Maoi game in the series. New challenges and graphics that to me were great quality. Getting the gold on all levels can be accomplished - after several replays, but stil do-able. Hours upon hours of fun game play. Looking forward to Maoi V! Rated 5 out of 5 by pennmom36 from Have They Angered The Gods? Hero and Bright Light are back, and they're not alone! The adventurous duo are now proud parents of twins, Hika-Ri and Koa-Ri, but unfortunately, the gods are angry. Their island began to rumble and shake, towering waves crashed down upon the coast, destroying the coastline settlements. Many people thought the gods were punishing them, but once the tremors subsided, several islands began to rise from the ocean, surely this is a good sign, right? Hero and Bright Light are eager to explore with their new family, but first they must restore the settlements destroyed by mother nature, with your help of course. I love the Moai series, and the graphics keep getting better and better with each episode. The tasks are clear and obtainable, and there's always a nice variety of features, however, I don't see the need to present a Time Management game as a Collector's Edition, as this one was. The only feature even remotely beneficial would be the Strategy Guide, but it's very difficult to get "stuck" on a TM level, after all you can replay any level as often as you want, so to me, it's really a waste of money unless you've just gotta have a few wallpapers and a few extra levels, so for me, this Standard Edition is perfect, and well worth the SE price. There are two modes of difficulty available, Easy mode which is untimed for a relaxing experience the other is Casual which is designed for gamers familiar with TM games. The Collector's Edition offers game even more Achievements to earn than the last episode, a total of 68, which has to be an achievement for just about anything and everything you could do (or even think about doing for that matter!) Each level has treasure chests available which contain valuable artifacts and bonuses such as the Sandals of Speed which give the Moai a little more speed to get the job done. There are several different Artifacts to earn that will help you progress by increasing resources by a specific percentage, and other perks such as that. The Artifacts are kept in your backpack and you can choose a handful to apply before each level if you choose. A new feature in this fourth edition, are progressive upgrades to Hero as he improves and polishes his skills as a leader, such as his Ability level to negotiate and his Influence and power as the King of the Moai. This is one of my favorite Time Management series, tasking you to remove obstructions from pathways, plant crops for food, build sawmills for wood, quarries to produce stone, repair destroyed property, fix broken bridges, collect resources, trade goods at the market and even talk to giants! I loved the scenery when the Moai discovered a way to breathe underwater, with coral trees, and colorful octopus. This is a great game for beginners and seasoned TM players as well. The Collector's Edition has 4 Wallpapers (which are cartoonish in style) 9 Music Soundtracks, 14 Character Biographies, Bonus Levels, and a Strategy Guide, enjoy! Rated 3 out of 5 by katnap123 from Way too much dialogue! I understand that a turtorial is needed and that dialogue is part of the game, but this went way above and beyond what was needed. So much so that the game was constantly being interrupted. It got very annoying. Playing with the timer was challenging enough, but was it necessary to stop the game flow to instruct the player to "open the chest?" and to "pick up what's fallen from the chest?" I can understand the dialogue at the beginning and end of a level, but not constantly throughout the level. The game continues but the player is unable to perform any actions. It gets even worse when you have to click thru all that dialogue each time you start a level over to try to earn the gold star, and the dialogue doesn't just pop up, it scrolls ...uggh. I almost gave this game four stars, in spite of my frustration. The graphics were decent, the story was fun, and it is a TM game afterall. I played several levels with the timer, then I came back some time later and started the game over on "easy." The game did get better the further along I got. The dialogue eventually quit interrupting game play, but I was too frustrated by then to start the game over again, so I could earn my gold stars with a timer. Still, good TM games are too few and far apart. I loved the Royal Envoy series, and this one is almost comparable ...and more difficult. I definitely recommend trying this one for yourself. This game got a high rating, so don't let my initial frustration deter you from trying it and making up your own mind. As for me, I'll probably pass on future Moai games if they're all like this one. Rated 1 out of 5 by lamlammil from Hated it! Very unchallenging. You have to repeatedly kill lots of birds which is long and boring. You are just sitting waiting to kill more birds to reach the quota.